They say that the female business power suit demands respect. Maybe it does, but a female in a business power suit, WALKING to work, definately demands my respect! 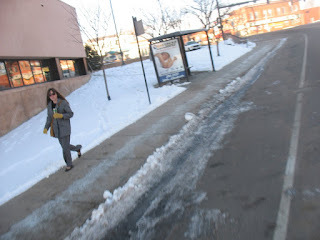 I have seen this woman walking a few mornings near the library on her way downtown. It seems like every time I see her, it is extremely cold outside too! So, either her car breaks down when it's cold out or she really loves the feeling of a cold brisk walk. I'm hoping for the latter.